One of the most misunderstood areas of selling records is setting a price. Many people who inherit a collection or buy some records at a yard sale get excited when they see high prices in a price guide. What they don't realize is, their records are probably not in NM (near mint) condition, and are worth a fraction of book value. Acquire some records to sell. We'll just assume you have some records you want to sell and are planning to sell them locally or on ebay. See my other related articles on grading and selling records on ebay. 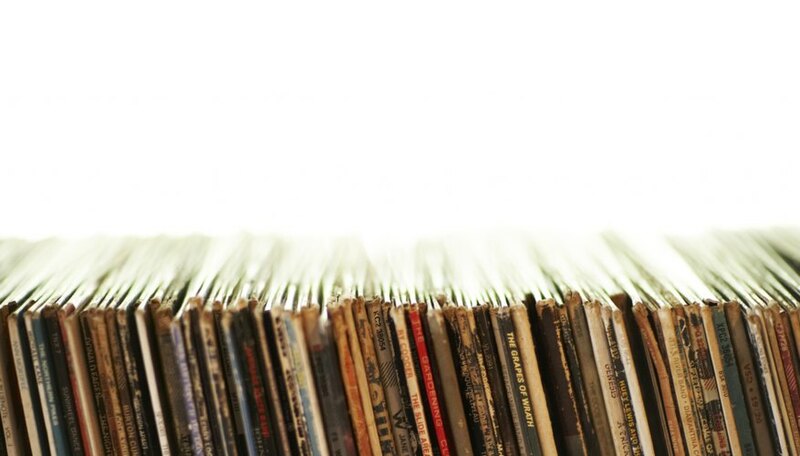 Get a current record price guide. Goldmine books are common in large bookstores, and Jerry Osborne's "Rockin' Records" is a massive and comprehensive work. "Rockin' Records" also has a CD version, and Osborne offers other books and CDs for pricing Elvis, soundtrack, various artists, and other records. Check online guides such as the Record Collectors Guild, which also recommends -- in addition to books available at libraries -- online price guides such as Popsike.com, which compiles vinyl record prices from eBay sales. Other online sites, such as Recordmaster.com, charge a subscription fee. Grade your records. Here are some general guidelines that will get you the most reasonable amounts for your records. Book prices are based on a record being in NM (near mint) condition, a very high and rarer collectible grade. If your record is not NM, don't price it at NM levels. SS (still sealed) or M (mint): 120 percent to 125 percent of book. These go for a premium, since they are unplayed and intact. If the cover is damaged, you will have to deduct a percentage. NM (near mint): 100 percent of book. Discount for cover or obvious label damage. Some very rare, error and collectible records may sell for more than book. Check out prices online if you think you have a special pressing. Do your research because sometimes, doubling or tripling of book price is possible. EX (VG++): 80 percent of book. VG+ : 50 to 60 percent of book. VG : 33 to 50 percent of book. More collectible records will skew toward the higher end of the range. VG- : 20 to 25 percent of book. G : 10 to 15 percent of book. Again, some highly sought after records may price higher, especially 1950s rock 'n' roll and R&B. P and F : 0 to 10 percent of book. There would have to be a compelling reason for someone to want to buy a record in these low grades since they're usually not listenable and the cover is in bad shape. Check for promotional releases. Records originally issued with special labels, stamps or stickers indicating that they are promotional (promo), DJ or audition copies can be worth 25 percent to 100 percent more than regular releases. Mostly, records released from 1949 to 1970 have this appeal to collectors, since it confirms scarcity or an original early pressing. Later records don't usually see much of a bump in value due to being promos. Research the market by looking at current and recently closed eBay auctions. Grade accurately. Use a good price guide, such as Osborne's "Rockin' Records." Look for promo markings for added value in older records. Don't overprice common records. Don't underprice collectible records. Don't be an eBay "bottom feeder," selling records for too little and driving market prices down.